Strait of Singapore Sheet 2. 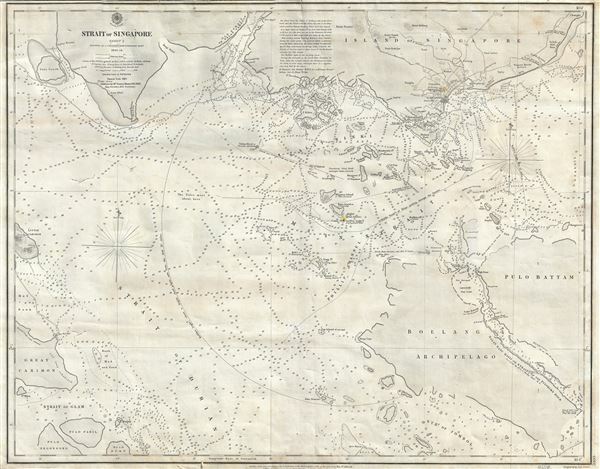 A scarce 1861 British Admiralty nautical chart or maritime map of the Strait of Singapore. The map covers from Singapore Island to Pulu Paril and from Great Carimon to Pulo Battam, focusing thus specifically on the waters just south of Singapore. Identifies the city of Singapore with the street grid clearly rendered. This is chart two of a series focusing on these waters. The basic survey work for this map was completed between 1846 and 1854 by J. T. Thomson. The present example features updates and corrections to 1861. This map is extremely rare being the only known example outside of an institutional collection. Very good. Original linen backing.